Hope you all like the appearance of the young Cyclops in next month's X-Men Origins: Wolverine, because plans are for you to see much more of him... and some other younger familar faces, too. It is the first class of Xavier's school, way back when, so it's young Scott, young Jean, young Beast and that'll be really fun... I think (the plan) is to follow some of the characters into their own stories, and weave them back into the X-Men world. And hopefully First Class will become its own franchise and we can follow them as they grow up. 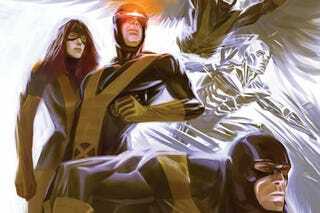 While I'm kind of excited about the idea of Josh Schwartz writing teenage Cyclops and teenage Beast, what's with all of the X-Men spin-offs being flashbacks? Is this a subtle admission than X-Men: The Last Stand ruined the franchise?